Fire-resistant materials partially cover the doors and shutters to Sperry Chalet, while its deck and roof are protected with sprinklers. This photograph was taken after an "ember storm" allegedly allowed the fire inside the structure, and flames burst from a window dormer. An investigation into the incident is wrapping up. An investigation is wrapping up on the events surrounding the Sprague fire, which burned the Sperry Chalet last summer. The Mount Brown Lookout Tower was fully wrapped in fire-resistant foil. After an "ember storm" from the Sprague fire ignited flames in the Sperry Chalet Aug. 31, only the stone shell of the structure remains. Secretary of Interior Ryan Zinke has put $12 million in the National Park Service budget to rebuild the popular backcountry dormitory. In this shot taken on May 2, 2018, during a flyover by the Glacier National Park Conservancy, the stone walls of Sperry Chalet's dormitory appear to remain intact. As the Sprague fire danced slowly across the west side of Glacier National Park last summer, fire managers put the bulk of their resources into protecting Lake McDonald Lodge and nearby private homes. They gambled that the fire would move west, toward the lake, and that rocky terrain, a sprinkler system, four firefighters and minimal fireproofing would protect the popular Sperry Chalet, about 2 miles to the east. They lost the bet. The fire exploded. In a single night, it doubled in size, roaring north, south — and east. Now, Interior Secretary Ryan Zinke is proposing spending $12 million in public funds to rebuild the historic structure. When the ember storm showered the Sperry Chalet on Aug. 31, 2017, photographs show that only a small portion of the structure’s wooden doors and shutters were covered, leaving the timbered roof and deck vulnerable. An investigation is wrapping up on the firestorm that left only the chalet's stone walls and two chimneys intact. Official information about the Sprague fire is expected to be released “soon” as part of a Facilitated Learning Analysis, typically undertaken after an “incident within an incident” occurs. Until then, Glacier National Park officials and the U.S. Forest Service have declined to discuss in detail the events that led to the chalet’s demise. However, documents requested by the Missoulian, known as Incident Action Plans or IAPs, outline what management actions were undertaken prior to the ember storm that burned the Sperry Chalet. The IAP is a roadmap of firefighting strategy. The Sprague fire sparked from an Aug. 10 lightning storm amid a record-setting fire season exacerbated by drought. As of September 2017, in Montana alone 21 large fires had run across more than 438,000 acres. Oregon and Washington reported more than 1,000 wildfires. In a brief conversation last week, one of the incident commanders, Diane Hutton, offered an explanation for some of the difficulties in protecting the Sperry Chalet. “We had limited resources, and it was a matter of where to put those limited resources in regards to the fire behavior at the time,” Hutton said. “Between the terrain, location and the lack of safety zones at the Sperry Chalet, plus having 150 other structures as well near the lodge, we did everything we could." Hutton, a seasoned fire management officer for the U.S. Forest Service, inherited command of the fire on Aug. 25 from Jim Edgren, a Flathead Interagency Type 3 team leader. His strategy, as of Aug. 17, had been to “manage the Sprague Fire under a Confine/Contain strategy” by using natural features, such as ridges, creek bottoms, avalanche chutes and rocky areas to keep the fire west of the Continental Divide and east of McDonald Lake. He planned to use sprinklers, pumps and aviation resources to keep the fire away from structures but allow it to burn in the backcountry. That’s not unusual. Wildfires are one of the natural tools Glacier Park uses to manage wild lands, but managers also make heroic efforts to keep flames from the doorsteps of structures. In this case, the historic Lake McDonald Lodge and 350 buildings and outbuildings around the lake, where hundreds of tourists were visiting, were about 2 miles to the west of the Sprague fire's start. Fire managers also listed other “values at risk,” which included some roads, and backcountry trails and footbridges, as well as the historic Mount Brown Lookout tower about three-quarters of a mile to the north, and Sperry Chalet. A press release issued on Aug. 15 said the plan was to keep the fire within natural and human-made firebreaks due to the steep terrain, concern for firefighter safety, and the scarcity of firefighter resources because of the high fire activity throughout the Northwest. The next day, three Glacier National Park firefighters were assigned to the Sperry Chalet to implement structure protection. By Aug. 18, after 34 firefighters had arrived, three were still assigned to the Sperry Chalet while other personnel were to “develop structure protection for McDonald Resort & private landowners,” according to the IAP, and to coordinate with park rangers to create an evacuation plan. In addition, some were continuing to assess potential impacts, and implementing pump and sprinkler systems in Snyder and Sprague creek drainages. The Aug. 20 IAP features a photo of the historic, two-story Mount Brown Lookout enveloped in fire-resistant foil, except for the exterior walkway and railing. Six firefighters were assigned to the lookout. Meanwhile, the much larger, two-story Sperry Chalet, which could sleep about 50 people, had sprinklers installed on its exterior with five firefighters assigned to be at the structure. They were told to monitor the fire and “establish trigger points for protection plan.” Some fire-resistant foil also was put in place. Eleven days later, on Aug. 31, photographs of the Sperry Chalet that show flames shooting from a dormer window also reveal that the structure was minimally wrapped. Posts along the deck had foil caps on the top, but nothing on the longer, lower portions. The wooden doors and shutters were anywhere from two-thirds to one-half exposed, and the shiny silver foil looked as though it was wrapped around the bottom of, but not on, the wooden deck. When Hutton took command of the fire on Aug. 25, her strategy was full suppression, confinement and containment. Like all fire managers, her highest priorities were firefighter and public safety. She also wanted to slow the spread of the Sprague fire toward “values at risk” — the Sperry Chalet, the Lake McDonald Lodge and other public and private structures. At the time, the fire covered 1,537 acres and had been burning for 15 days. Hutton said she didn’t order the chalet to be wrapped with the fire-resistant materials because it would be too dangerous for firefighters. In addition, they were focused on the other structures and people closer to Lake McDonald. “It’s a tall structure, and to wrap the whole thing would have been too hazardous for firefighters,” Hutton said. Four of 53 firefighters working on the Sprague fire were ordered to protect the Sperry Chalet the day it was overrun by flames. The National Park Service has redacted the names of firefighters who were assigned to protect the Sperry Chalet from the daily IAPs. But a press release issued after the structure burned noted that “a highly skilled group of firefighters were staged at the Sperry Chalet …” at the time of the Aug. 31 ember storm. A high-level firefighter involved in the Sprague fire questions whether the four were “highly qualified.” He told the Missoulian that instead of deploying the more experienced crews — who have specialized training — at Sperry, at least two of the four at the chalet were Type 2 firefighters, who only need 40 hours of classroom training and are at the bottom of the firefighting chain of command. Instead, the more experienced firefighters were tasked with continuing to “treat fuels” surrounding park-maintained properties, assess private structures, and create defensible spaces, according to the daily IAP reports. It was a task they had been doing for about a week, according to the IAPs. Hutton turned over command of the incident on Aug. 30 to Bob Fry, after she “timed out” under firefighting rules and was required to take two days off. Fry continued her strategy until she returned Sept. 1. Page after page in each day’s Incident Action Plan reveal that fire managers were confident that the rocky terrain surrounding the chalet, coupled with the sprinkler system, would protect it. 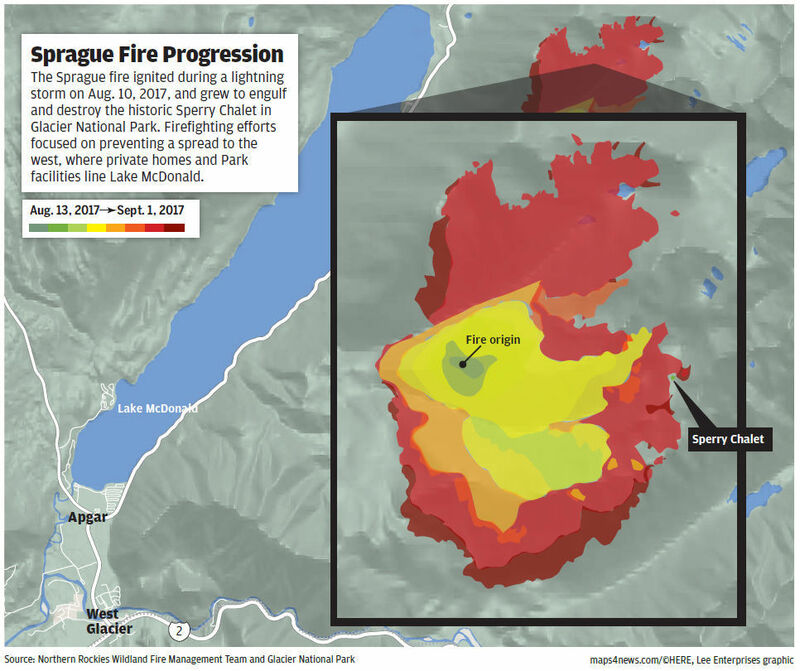 Once firefighting crews were on hand and the assessment of potential impacts was made, fire managers focused on keeping the Sprague fire from moving to the west, toward Lake McDonald Lodge and the other structures. On the day the Sperry Chalet burned, 34 firefighters assigned to structure protection were continuing to treat fuels surrounding park-maintained properties, according to the IAP. Those firefighters also were chipping wooden materials like tree branches in the McDonald Lodge corrals, starting fuel mitigation at Avalanche Campground and continuing assessment of private structures. Their purpose was to create defensible space around the park and private structures. The four firefighters at the Sperry Chalet, who were part of “Division Whiskey,” were to “monitor fire progression along the west flank and into Lincoln Creek,” even as the flames crept to the east toward the structure, as well as to the north and south. The three divisions had similar outcomes, or “end state” goals: Waiting for a “season ending event” like a snowstorm, and having no significant injuries while protecting the lookout, the Sperry complex, and the structures around Lake McDonald. A “Red Flag warning” was posted at 7 p.m. Aug. 30 for the next day, noting the “breezy west-southwest winds and low humidity will result in active fire behavior, torching, group torching, short crown runs and spotting. Winds will push the fire to the east where fuels are available.” The probability of ignition for spotting, flame lengths and spread rates was listed as 75 percent, depending on the site. And push it did. The fire grew from 2,097 acres on Aug. 31 to 4,646 acres Sept. 1 — to the north, to the south, and east to Sperry Chalet. Despite the sprinkler system, the four firefighters and four helicopters’ best efforts, at 6 p.m. Aug. 1, flames swallowed the Sperry Chalet. The next day, eight additional firefighters — a total of 12 — were stationed at Sperry, but their task had shifted to “aggressively” mop up the hot spots at the chalet. Incident Action Plans are a road map of firefighting strategies. Even though I never once set foot inside Sperry Chalet, I loved it. Who didn’t? Could Sperry Chalet have been saved?